In this center column below are posts of individual books that we think are worth special note. If you've read one of them, feel free to leave a comment below its post. "Tweet" your favorites - "Like" them - "Digg" them - it helps the author a lot and gets our message out there. 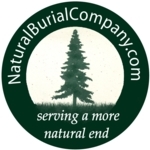 And remember, when you buy your books and products through our websites you help support the work we're doing to educate others about natural funeral and burial options, so thank you in advance for your patronage! Now, happy browsing... And feel free to suggest books in the comments section below. This is the first contemporary, practical guide that covers all aspects of planning a memorable service. This is the most recent edition - a new one is due out in the next year or so, but for those of you who want a copy of the Natural Death Centre's flagship book and can't wait, this is packed with still relevant information.